I sat, SES uniform ready & bag packed, waiting for our deployment orders to come out. 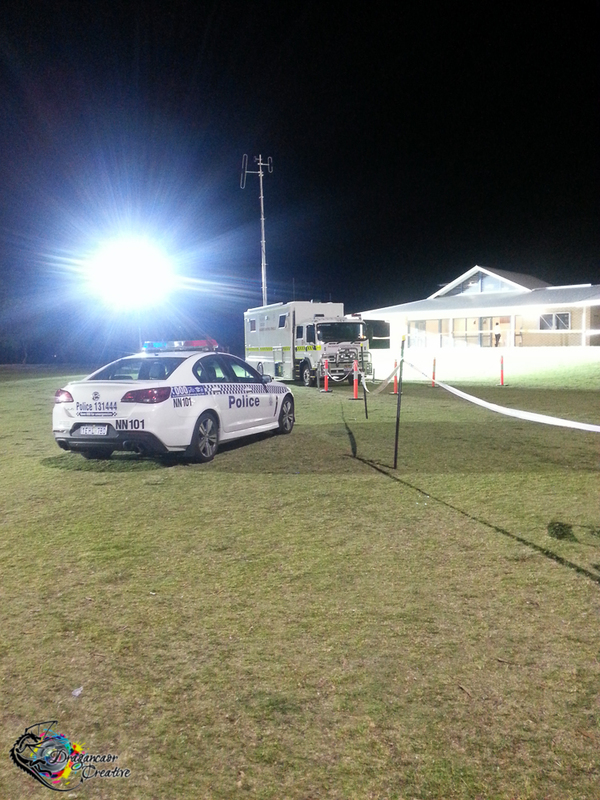 Police parked beside the SES/DFES Incident Control Vehicle (ICV) at the Community Centre in Landsdale, Tuesday night. We’d been stood down Tuesday night (Wednesday morning) at 1am, after a long day of searching for Sam through yards & houses. We had to have a set amount of time for sleep for OHS reasons, but we were expecting to get our calls for redeployment around 11am. I spent the time waiting, reading the articles about the day before. Looking at photos of the searchers – all those hundreds of strangers who were just there because they didn’t want to stay at home & not be helping. Looking at the SES personnel in the photographs, recognising faces & stances, recognising the search dogs & handlers I’ve worked with before from Search Dogs Australia. That’s Kate’s back. That’s us. That’s Michael. That’s Bella’s handler. That’s one of the cops we were talking to when we got dinner at the Salvo’s truck last night. Sleep had been difficult overnight, knowing we still hadn’t found him. Knowing that it was cold & windy, that Sam was only wearing a short-sleeved shirt & shorts, & no shoes. 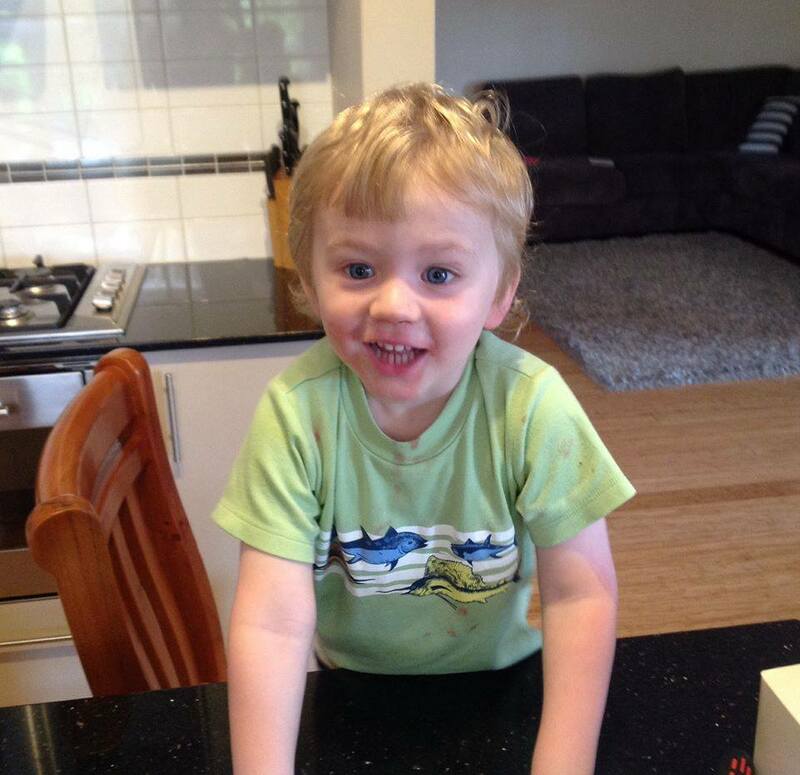 He was 2 ½ years old, & a thousand people out looking for him still hadn’t found him after 12 hours missing. We could only hope that he was playing a game – that he was just really good at Hide & Seek & wanted to prove it to everyone. My partner is SES too, & that night he was still Duty Officer – the person who carries the phone & pager for the Stirling SES Unit, liaises with ComCen & is responsible for sending out deployment orders related to our members’ availability. State Emergency Service members are all volunteer & we have to leave our day jobs to attend call outs, many of us grateful for having understanding employers who support what we do. That night, the phone kept going off – mostly for more members sending through & updating their hours of availability for the search. He’d been on the search too, as Team Leader for one of the teams. Unlike me, he slept like a log, needing me to wake him up each time that phone received a message or call. 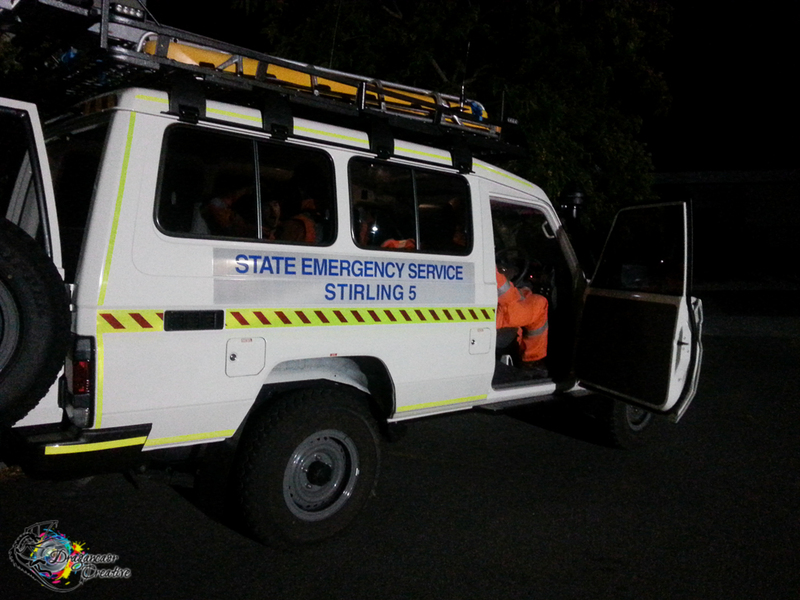 The public were also calling the SES, but it wasn’t to ask for help – it was to find out how they could help with the search too. My phone kept getting messages from friends & family asking for updates & if there’d been any news. I ignored them. I felt bad, but I’d needed to sleep & I had no information to give them. By the time mid-morning came, I’d had as much sleep as I was going to get. My partner had gone to work, still taking calls & working out teams. I sat at the computer with my cup of Earl Grey, reading the news & awaiting my orders. I rang a friend in Sydney, asked if she minded talking while I waited. Distraction. Each time an SMS came through I jumped to the ready, in case it was deployment orders. Normally, there isn’t that heightened sense of urgency. It’s never sedate, by any means, but it’s not normally like this. A Journo friend messaged my phone, “Tagged you in a post on fb, he’s been found?” The post in question was by Channel 10. Speculation, nothing confirmed. I messaged the Duty Officer, my partner, asking if it was the case – had they found Sam? More news sites started posting the same. But were they reporting what they’d heard or what was definite? Nothing had come through to say stand down, so perhaps it was another bit of misinformation like the Police mentioned on their Facebook the night before. Clutching hope. It’s not confirmed, therefore it’s not truth. Speculation leaves room for hope. Within moments, my phone received a long message from our Duty Officer. It was to stand down. That Sam had been found, deceased, that morning. Offering help to any of us who may have been affected by the search & were wanting/needing to speak to someone. SES & DFES have a number of avenues available to help us with this sort of thing. It was tragic. It was devastating & entirely not fair. I never knew this child & I did not know his parents. But I felt that loss, as every other searcher would have. That hope that we had clung to for almost 26 hours was unceremoniously torn away. I can’t even begin to fathom the pain his family are enduring. I know how much I hurt now, & how our teams felt out there. I feel for the police divers who found him. I feel for the tradies who left the front door open for that split second that it took for an opportunist child to run off to explore the other side of it. They will have to live with this for the rest of their lives, no different to the bowler in the cricket tragedy a few short weeks ago. But our efforts weren’t in vain. The time spent searching was not wasted. While the end of our efforts was tragic, Sam’s family at least have closure. I’m not trying to be heartless, for it’s a horrible result, but they’ve at least got an answer. In some ways, I’m clinging to the fact of that closure. Knowing is better than wondering, because at least they can begin their stages of grief & eventually be able to move forward & continue on with their lives. I messaged my best friend & asked her to hug her two children, who are my god-kids, tightly for me. This Sunday, a group of us are supposed to be going on a ride to view the Christmas Light Displays around Perth. I feel like I’ve done this already – walking through Landsdale, searching for Sam in & around those beautiful outdoor displays. We were searching under & around Christmas trees in peoples’ homes too. I don’t know that I’ll be able to separate the sadness from that memory yet, of those streets lit by thousands of coloured fairy lights as we searched on Tuesday night. The horrible juxtaposition of a holiday about family with a family’s tragedy. Sam’s grandfather was on the news, struggling through reading a statement from their family. They have respectfully asked that people do not send floral tributes, but instead to make a donation to the Autism Association of Western Australia. I can only hope that Sam’s family take some solace from the outpouring of love & support that so many hundreds of strangers showed them yesterday & today. Rest in Peace, Sam Trott.